For those who are interested, we give everyone the opportunity to apply for our membership. The profit we receive will be used for future Permias events. One of the benefits of purchasing the card is the privilege to have special discounts or promotion from our sponsors by presenting this card. 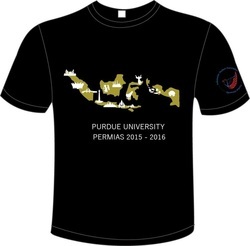 Our soft and thick T-Shirt features the map of Indonesia with the most popular landmark from each region of our country.